Cooking in someone else's kitchen: How does your garden grow? We measured the area of all the vegetable-growing space yesterday (just the beds, not the paths between them). I've described before how I started growing food in earnest (rather than just growing a few parentally-donated tomato plants in gro-bags, which is what I usually did prior to 2005) in our back-garden in Manchester. By 2005 we were already planning to emigrate, so it wasn't worth trying to get an allotment, although there were some allotment plots within walking distance of our house. To be completely honest, the idea of having such a public space to learn in would have put me off, too - I like to experiment in private! 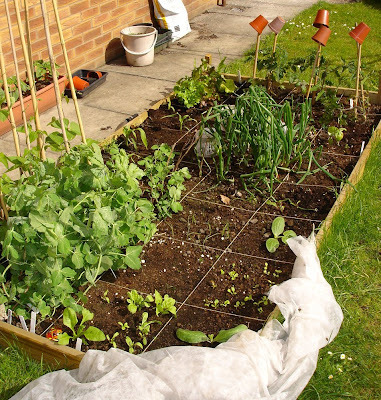 So, my total growing space for vegetables in 2005 (one raised bed) was 32 square feet (3 m²). In 2006 we added another bed, bringing the total to 64 square feet (6 m²). By 2007 we were in Canada. Arriving in late June meant that we had no space or time to grow vegetables, but that summer we did plough up part of the barn yard and create eight vegetable beds which were planted with buckwheat as a green manure. Total growing area: 1,059 square feet (98 m²). Two more beds were created in the spring of 2008, brining the total to 1,540 square feet (143 m²). In 2009 we have the three greenhouse beds and one more bed in the upper part of the barnyard, so the grand total now is [fanfare] 2,143 square feet (200 m²). I don't really plan on expanding the outside vegetable beds any further: keeping on top of the weeding would just be impossible. There might be some more greenhouse beds next year though, so the figure is likely to climb again. It is quite amazing to think that my vegetable garden is now 66 times bigger than it was in 2005. It certainly won't all fit into one photo any more!! Very brave of you to throw yourself so completely into this. Hope you have invested in that other worthwhile North American essential, the chest freezer. I'm writing at the moment from Ile d'Orléans in Québec, a big agricultural community. Here, you can rent a commercial freezer locker (like a self-store place, but refrigerated) for all your produce. I remember those from when I was young in small towns in Ontario. 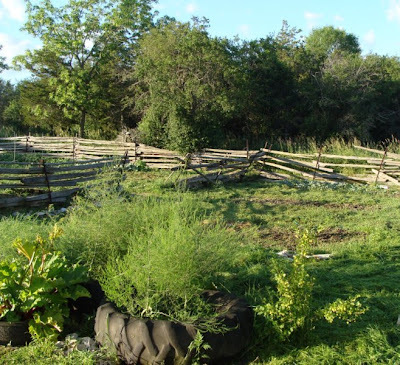 Are you thinking of creating an asparagus bed? I just grew the odd herb or two before we moved here, + a few tomatoes in the greenhouse. While I don't think we've got the area you now have, those raised beds just kept multiplying - and still there doesn't seem to be enough. What part of Manchester? We lived in Stockport. Hi Helen - the tyre/tire garden in the foreground is an asparagus bed, but I would like another one, too. I tried planting some bought roots in a different part of the garden this year, but none of them took. Maybe next year I'll order some more and try again. And yes, I've got a chest freezer! Haven't had to turn it on yet, but a sign of success this year will be the ceremonial switch-on of the freezer. Mountainear - we lived in Sale (which is officially now a borough of Greater Manchester, but which still insists on 'Sale, Cheshire' as a postal address - it's a bit posh like that).